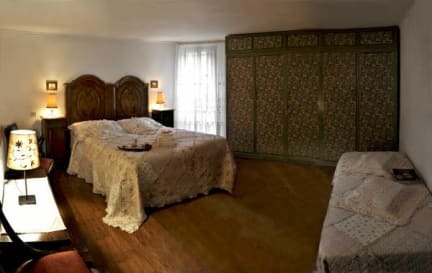 B&B San Giacomo Venezia i Venezia, Italia: Bestill nå! The value of the first night. Very easy to reach by foot!! 500 ms. From the train station and 600 from the bus station: a typical and cozy and warm venetian house, with low roofs wit beams in wood just restructured, in the historical center of venezia, at 10 minutes by feet from rialto bridge !! hospitality, warmth, friendship, sympathy, and any useful advice to our guests is what distinguishes us. .personalized reception with delivery keys and request individual preferences for breakfast. .if needed, we will can pick you up at the train station. Please notify as in specific at the booking request. At time of arrival please call us by phone. .special discounts for our customers in restaurants and pizzerias. Ask for special discounts in 'gondolas' !!!!!!!!! - 2 double beds and 1 single bed. The room is very large, comfortable and bright, has a whole wall window overlooking a charming venetian square, cosy roof with wooden beams and parquette. The furniture style is 'romantic' and is entirely new, inaugurated by little. In the night the lights light and the view over the square, giving a warm and charming venetian atmosphere. We are pleased to make available to you a bright and comfortable room , its windows overlook in a typical and very quiet 'calle veneziana' (venetian street) at few steps from the channel through which the old bridge 'ruga vecchia'. The bathroom is large, with bath and shower, two sinks and all marble 'travertine'. It is cleaned and disinfected twice daily. The second bathroom is little but complet. it is peaceful and friendly and we put ourselves at your disposal to come to you in your needs. We are in the middle of the historic centre of venice this will allow you to visit all sites at walking distance.